Content marketing has always been rated one of the best and most effective advertising tools that a business can use since the birth of the internet. However, it’s worth remembering that the content marketing ‘niche’ is incredibly diverse and there are dozens of formats and techniques that can be implemented into your business’s marketing strategy. One of these approaches, and perhaps increasingly one of the most popular, is influencing marketing. This is where a business approaches an influencer, which could be an individual or an organization, such as a publication, who can talk about your business, products or services to their followers. When their followers here about your business, they trust what the influencer is saying and turn their attention to you, boosting your social media figures, website traffic, and overall revenue. That’s the very basics of how it works. According to the Augure’s State of Influencer Engagement study, 49% of marketing professionals stated that influencer marketing strategy had great results. However, influencer marketing isn’t that simple. In reality, it’s a little more complicated than that, and there are a lot of rumors and misconceptions about the entire tactic. 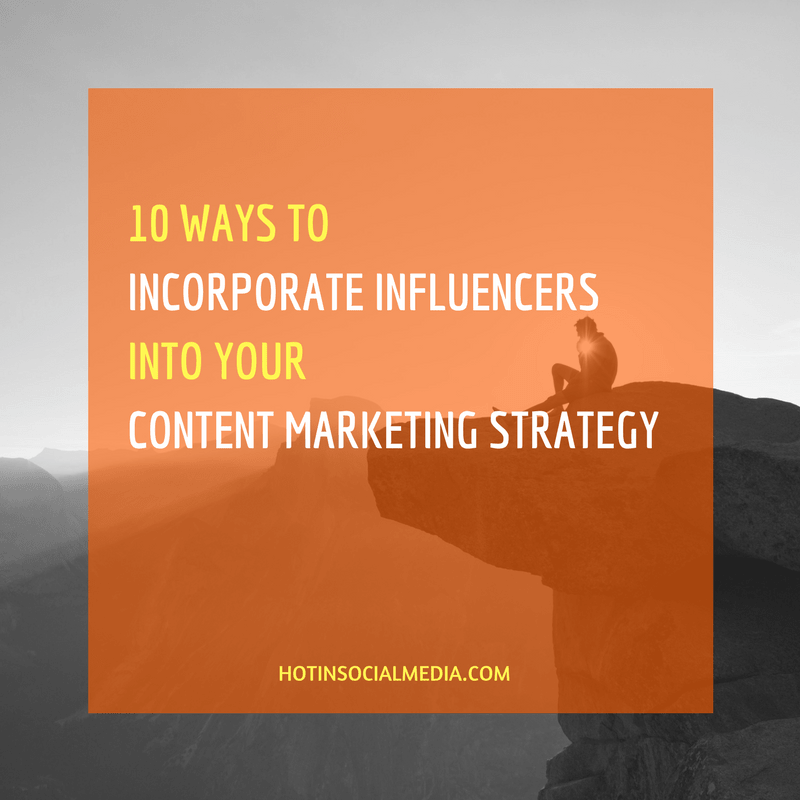 To help you alleviate these worries and so you can use influencer marketing to the best of your abilities, today we’re going to explore ten ways you can incorporate influencers into your content marketing strategy. Firstly, many marketers make the mistake of confusing an influencer with an advocate. In short, an influencer is typically an individual who has several thousand followers across multiple platforms and have some sort of media that defines them. They are paid to work with brands and usually work from incentives. On the other hand, an advocate is someone who passionately talks about a brand or product that they like, regardless of whether the brand is recognizing them or not. Typically, these people work for free and will have several hundred followers max. When you’re looking to work with an influencer, make sure you are actually working with an influencer and not an advocate to maximize your business’s opportunities and the success of your marketing strategy. One of the most effective and most straightforward ways to incorporate an influencer into your marketing strategy is to work together to co-create content for your website. Of course, the aim of the game ideally would be to create viral content but this no easy feat, but working with an influencer greatly increases your chances of this happening. This is especially true since they will already know the ins and out of how social media works for them; knowledge that you should never side-line. You can use the help of freelance writers from Upwork and UKTopWriters in this content creation process. This works well because you can create the kind of content you want to be associated with your business, plus you can use the knowledge of your influencer who knows what their followers (and your followers) want to see. Perhaps the easiest way to use an influencer’s power is to allow them to feature your products on their social media pages and blog. This directly puts your content in front of their followers and therefore directing them to your pages. All you need to do is select which products you both agree will work, send them some freebies or samples, and they’ll be able to create posts which they’ll, in turn, tag your brand and your business pages. For example, the influencer could be wearing your product or using it some way. This approach works really well because the influencer is using their credibility to leverage your product with their followers are sure to love. You might have seen pictures of watches of Instagram taking in beautiful surroundings. This works very effectively. According to recent statistics, 59% of people said they wouldn’t buy or use service from the company which has errors and typos in their content. So it is necessary to proofread any posts you upload with your influencer and proofreading services like Grammarix or Best Australian Writers to ensure they’re free from any mistakes that could damage either party’s credibility and reputation. Of course, an effective way to boost your own sales is to offer your customers discount codes and offers but how about generating custom discounts just for your influencer’s followers during your campaign. This is a highly effective way to use an influencer since their followers feel like they’re getting an exclusive discount from somebody they follow. According to different case studies, discounts lead to high conversions and lead to 121% increase in companies’ revenues. This means you’re not only benefitting your business, but also your influencer since more followers will want to use your discount. This is great for a long-term strategy and for building solid relationships with an influencer, so you can work together over time. As a rule of thumb, try to include the influencer’s name or something into the discount code to make it feel legitimately exclusive. There is a tonne of services that can help you generate these custom codes and set up your discount code promotional posts, such as. Social media takeovers are rapidly gaining in popularity, and if you’ve been on Facebook or Instagram recently, especially since the release of Stories features and live video, then you’ll probably have seen this in action. A takeover is where you give control of your social media account to the influencer for a predetermined amount of time, typically a few hours. Before the takeover, you and the influencer will advertise the takeover on your profiles ready for the big day. Then you hand over control of your account and let the influencer work their magic. If you’re looking for an ideal way to boost your engagement rates and follower counts as well as boosting your overall online visibility, you might not need to look further than hosting a competition or a contest. You’ve probably already seen various versions of this tactic used on social media, and it’s up to you how you implement it into your marketing campaign. The premise is simple. You choose a prize, whether it’s a product or something special, perhaps a holiday or a car, and you and your influencer promote this post. You then get followers to share/repost/like/comment/tag friends in the post for you to pick a winner. Of course, it’s ideal to cater the post and the prize to what you and your influencer’s followers are interested in. One popular tactic is to use custom competition hashtags to make things easier to manage and organize. Hand in hand with the method above, giveaways are always a popular method to boost social media engagement rates and follower counts. These are typically easier to implement than competitions because you don’t have to check through potentially thousands of people to choose a winner, you simply choose someone at random. Getting your influencer to host the giveaway is a great to get your products and brand in front of a sizable audience, rewarding you with a tonne of social media coverage, and one lucky winner gets a free product which they’re more than likely going to post about! Of course, one of the most tried and tested ways of using an influencer is incorporating them into the content that you’re producing, and the limit for this method is only restricted by your levels of creativity. For example, you could simply feature them in one of your posts, maybe as a quote talking about your product or business. Perhaps the influencer could leave you a review about their experience with your brand. You could even create a video to advertise your business, a video featuring your influencer. One of the best ways to describe this is to say you owned a clothing eCommerce store. You could easily feature your influencer in your content by having them model in your clothing ranges and then posting the images to social media. The research conducted by Moz and Buzzsumo after analyzing 1 million articles found that long-form content receives more likes and shares from readers. Don’t forget to make sure that you’re checking your content to ensure it’s high-quality and accurate. Be sure to check things like spelling and grammar in your content, which you can do easily using tools like Via Writing or Revieweal. Your influencer will not want to be associated with the poorly written content, and it can damage your relationship. One key thing to remember when it comes to using influencers is to try lots of different approaches to see what work for you. Of course, there are limits to budgets that may restrict this from happening over a short period of time, but each influencer will have a knack for what they do best. Although one of the best ways to use an influencer is to build a long-term relationship with them, that doesn’t mean that every influencer is going to be suitable for your brand and it won’t have the desired effects. With this in mind, it’s a good idea to do your research to see what influencers are out there and asking them what they can do for you and how they will benefit your business, almost like an interview. Don’t feel too disheartened if you use an influencer and you don’t get the success you were expecting. You can simply work with the influencer to try a different approach, or simply say that it’s not working and you’re going to try somebody else. As you can see, there are a tonne of ways to incorporate influencers into your marketing strategy and, if implemented correctly, it can dramatically drive up the success rates for your business. Remember to be creative and to listen to your chosen influencers since their knowledge is a key element to help your strategies succeed.